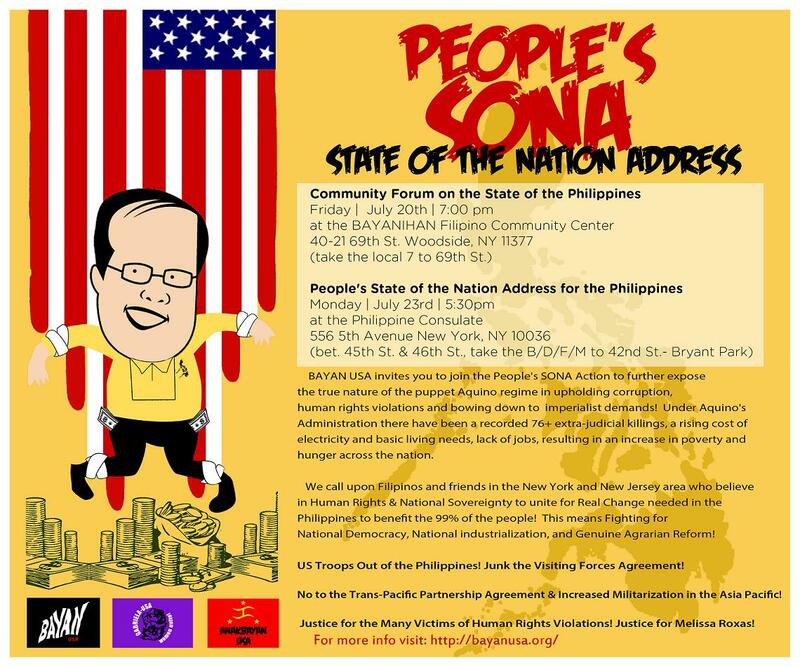 Mon, 7/23: Join BAYAN USA for The 2012 PEOPLE’S SONA IN NYC! On July 23, tell NOYNOY that THE PHILIPPINES IS NOT FOR SALE! BAYAN USA invites you to join the People’s SONA Action to further expose the true nature of the puppet Aquino regime in upholding corruption, human rights violations and bowing down to imperialist demands! Under Aquino’s administration there have been a recorded 76+ extrajudicial killings, a rising cost of electricity and basic living needs and lack of jobs, resulting in an increase in poverty and hunger across the nation. We call upon Filipinos and Friends in the across the Nation who believe in Human Rights & National Sovereignty to unite for Real Change needed in the Philippines to benefit the 99% of the people! This means Fighting for National Democracy, National Industrialization, and Genuine Agrarian Reform! US troops out of the Philippines ! No to the Trans-Pacific Partnership Agreement & Increased Militarization in the Asia Pacific! Justice for the many victims of human rights violations! Justice for Melissa Roxas!